This November 17th will officially mark one year since the release of EA and DICE's Star Wars Battlefront. Since then we've been treated to a collection of DLCs that have expanded the game's content exponentially, and the additions are still coming. To celebrate Battlefront's first anniversary, EA unveiled a slate of announcements today to further broaden the gameplay and give gamers something to look forward to before the year draws to a close. First off, they announced the Star Wars Battlefront Ultimate Edition. This new edition includes the original game, along with the DLC season pass which features all of the previously released expansions, including the Outer Rim, Bespin and Death Star packs, as well as the upcoming Rogue One: Scarif DLC. The ultimate edition is due out in November. Secondly, we also got a new look at the soon-to-be-released Rogue One: X-Wing VR Mission courtesy of some new key art(above) that was revealed. 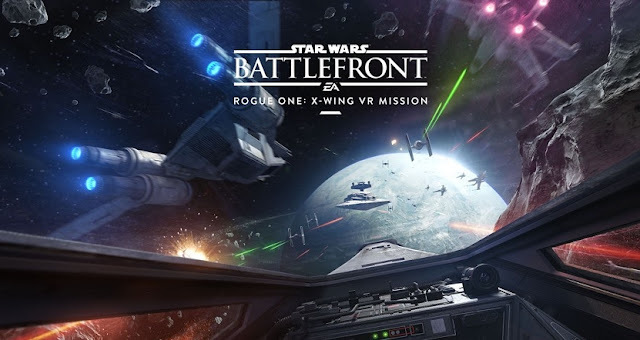 The artwork shows X-Wings, along with a U-Wing, facing off against TIE Fighters in space, thus confirming that some new ships from Rogue One will be part of this new virtual reality experience. This expansion will reportedly be available just in time for the Holidays. "From free trial weekends to double score events and more, there's always something going on in the world of Star Wars Battlefront. In fact, we're kicking off a 4X score event, as well as free trials of Outer Rim, Bespin, and Death Star for all players. Both events run from November 18 through November 20." You can learn more about Star Wars Battlefront by visiting EA's official site!